Dr. Virginijus Siksnys studied chemistry at Vilnius University and obtained his Ph.D. from Moscow State University before returning to Vilnius where he moved through different research ranks at the Institute of Applied Enzymology/Institute of Biotechnology. He holds the position of Professor of Vilnius University since 2002 and is Chief scientist/Department head at the Institute of Biotechnology of Vilnius University. He also serves as a Chairman of the Institute’s Board. 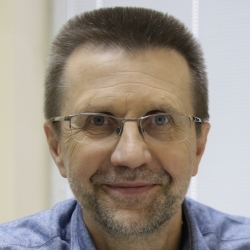 He is a member of Lithuania Academy of Sciences and his work has been recognized with several awards including the Lithuania National Science Prize. Dr Siksnys has made a major and sustained contribution to the understanding of the structure and function of restriction enzymes. His current research on the CRISPR system for antiviral defense has had a major impact on the field. His studies of the Cas9 protein paved the way for development of novel tools for genome editing applications. The award is a great honor, and I really appreciate your recognition of my personal achievements and contribution of my team at the Institute of Biotechnology of Vilnius University. It is great a privilege to be among such outstanding current and former awardees of Warren Alpert Foundation. This prize makes my work even more enjoyable and challenging.